Bill regularly defends individuals charged with misdemeanor and felony offenses in District and Superior Court and frequently handles motor vehicle violations and administrative hearings at the New Hampshire Department of Motor Vehicles. With a strong medical background, Bill brings a special depth of understanding to his representation of injured workers, disabled individuals and accident victims. Bill represents injured and disabled people before the New Hampshire Department of Labor, Superior Court, and Social Security Administration and handles ERISA long and short term disability benefits cases before the U.S. District Court for the District of New Hampshire. A strong advocate for workers’ rights, he represents victims of workplace harassment, discrimination and wrongful termination. Bill has also represented many homeowners, landlords and contractors in faulty construction cases, neighbor disputes, collection matters and eviction actions. A lifelong New Hampshire resident, Bill received his Bachelor of Science degree in Microbiology from the University of New Hampshire in 1995. In 1997, he received a one-year Certificate in Criminal Justice from McIntosh College. He received his J.D. 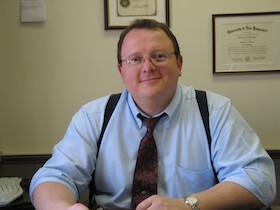 from Syracuse University College of Law in May of 2003, where he served as Managing Editor of the Syracuse Law and Technology Journal, co-director of the Grant Opportunities Public Interest Program, and as a teaching assistant in S.U.’s International Research and Writing Program. Also during law school, Bill worked as a legal intern for the Center for Bioethics and Humanities at Upstate Medical Center in Syracuse, New York and as a law clerk for a general practice law firm in Exeter, N.H. Prior to attending law school, Bill spent eleven years as an Emergency Medical Technician for a major pre-hospital care provider in southern New Hampshire and Maine. He is a member of the American Bar Association, the New Hampshire Bar Association, the Belknap County Bar Association, and the American Association for Justice. Bill proudly serves as President-Elect and Legislative Committee Chair for the New Hampshire Association for Justice. Bill is an avid guitarist and songwriter and enjoys performing and recording with other local musicians.